It rained today… first time in quite a while. Rained all day- made me miss the northwest. So, Carter got to experience some good ol’ puddle stomping. 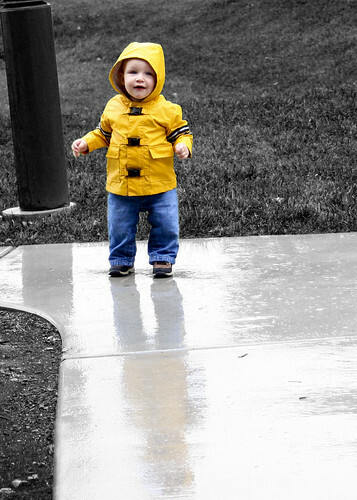 He loved being out in the rain, Cindy loved being able to put him in his yellow rain jacket, and I got to take a break from school/work to dink around with Photoshop a bit. Everybody wins! Oh that's too cute, i love it. Okay that is the cutest pic. i love your photoshop work with only him in color...nice work Chris! How fun! Carter is so big! It's been a while since I've checked blogs and everyone's kids are growing up! Love the jacket! I just made my kids stay in all day. Wow, sometimes I'm so lame! So good to catch up a little! Awww....I just wanna squeeze that cute kid!!! Sounds like fun- and what a great picture!!! Sure love you guys! I love the yellow jacket, really cute! That is really cool how he is in color but the background is not. Great Picture!! I love the photoshop work, Chris! I wish I was cool enough to use stuff like that. He's such a cute little boy. Happy Birthday! LOVE the cute rain jacket! Chris I'm so glad you're feeling better- that stinks! I love the pictures of Carter. We're coming out for the blessing so can't wait to see you guys then! I finally have something to say!